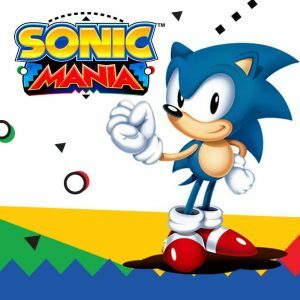 Sonic Mania is a 2D – platformer, which focuses on plaforming, exploration and most importantly speed. The title has an interesting origin story, as its developers have previously made Sonic Fan games and have now been hired by Sega to create a fully-fledged official title. Is the fan spirit of the developers the one ingredient necessary to create an awesome hommage to the original Sonic titles on the Sega Genesis? Let’s go fast and figure this out using our unique value-based review system! You know Sonic, we know Sonic, everybody knows Sonic, which is why we are skipping any further introduction and getting right to the critique of the story of Sonic Mania. To be honest, we might as well just skip this part as well since the story of the game is pretty much absent bar the bare essentials. Rescue critters trapped inside robots, collect the Chaos Emerals and defeat the evil Dr. Robotnik. Before we get to the gameplay of the game, where there are quite a lot of points we want to address, we just want to talk a little about the atmosphere of the game since it is definitely worth mentioning. While the lack of a sophistacated story may seem as a downside to some, we believe it is absolutely unecessary in this case. How so? Simple, when a game lacks a story, it needs to make up for it in charm and atmosphere and Sonic Mania has boatloads of those. This starts with the graphical style of the game, which is a direct port of the Genesis graphics to Full HD resolution. With it come great-looking animations and the ability to distuinguish all entities from one another well. The artstyle also leaves enough room for additional detail in the level, like Wanted posters for some of the game’s antagonists. This really makes the world feel alive, which is further backed up by awesome music. While the game uses a 16-bit artstyle, the soundtrack of the game is modern and rivals and possibly even exceeds the quality of some of the bigger budget games coming out nowadays. All of these nice touches definitely show how much the developers care about Sonic, as they’ve nailed the aesthaetic perfectly. Let’s move on and get ourselves talking about the controls. 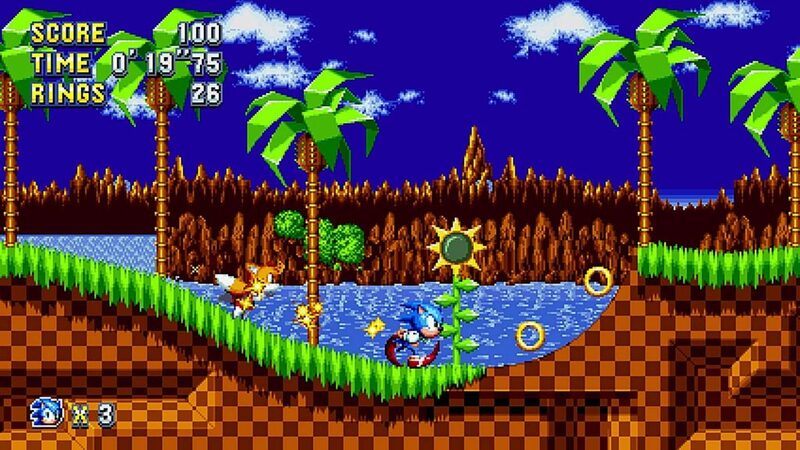 For a platformer such as Sonic, precise controls are of upmost importance and in the case of Sonic Mania, they are definitely great. Every single move feels natural and it is really easy to judge the distance of the jumps and your general movement. It is also quite interesting how the game is able to accomplish everything with just the thumbstick and a single face button input. Sonic’s unique move is the spindash, which you can make him perform by holding downwards and repeately hitting the jump button. This pattern charges up momentum, which Sonic can then unleash to blast of rolling at a high speed. This attempt to get all the controls done with a single button has downsides though and the most prominent one was that we sometimes ended up jumping instead of charging up momentum when pressing down and the single face button. This could have easily been alleviated by moving the charge to a second button and as the game is played only on devices that have at least four of them, it is strange that this option went unexplored. Another point where we felt the character control was lacking was during a single boss fight in an automated running section. 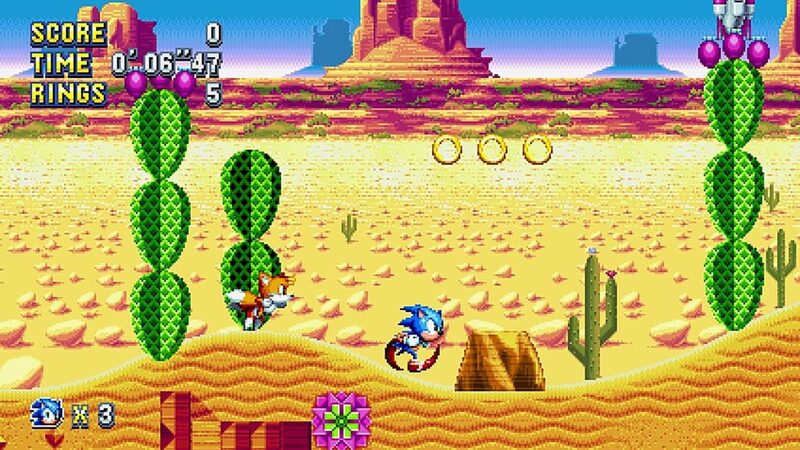 The goal here was to hit the blue rockets with a spindash to knock them back at the boss and avoid the red rockets by jumping over them. However, at the time you fight the boss there were very little auto-running sections if any at all beforehand and you are left experimenting with the now somewhat changed physics. The issue here is that jumping will significantly slow you down, making it very hard to aim the jump over the rocket correctly. Learning and adjusting here can take time, which is usually a good thing. Because of the checkpoint and Game Over structure of the game, which we’ll be going into in more detail later, this can be very frustrating though. One final point to mention with the controls is Sonic’s ability to run on walls and ceilings. If that blue hedgehog happens to be running on a ceiling, you have to press the direction opposite to the one you’re running to, to maintain your speed. This means, when going right on a ceiling, you have to hold left to avoid falling down. This is quite counterintuitive but fair enough, as the game oftentimes has you entering loopings and wants to avoid having you erratically change the direction you’re holding the thumbstick all the time. A nice and safe tutorial section would have been good here, as we ended up being quite confused about it in a very unsafe location. Once again, this would be fine if the checkpoint system matched and encouraged a trial and error approach. The level structure of Sonic Mania is as follows. 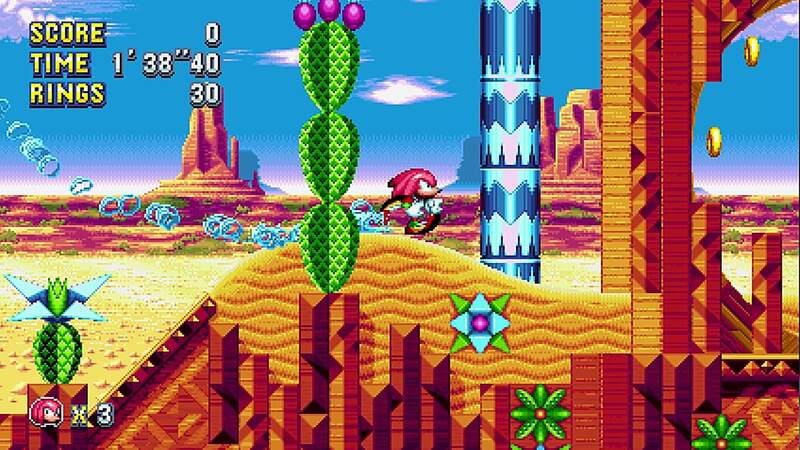 Sonic blasts through a total of 12 zones, which contain two acts each and have a boss at their respective ends. If you fail during a zone you return to one of the regularly placed checkpoints. The game features a life system though and if you run out of lives, you have to start at the beginning of the first act of the zone. This can be really aggravating, especially in the later levels, where each act can take close to 10 minutes to complete. If you then fail at end of Act 2 at its boss, you might need to play for another 20 minutes to get another shot at getting him down. With a limited amount of lives, this means you only get a few attempts at the boss before having to replay the entire level. This in itself can be quite annoying for some people; however, there are some upsides to this system. By repeating a level, you get a chance to further explore it and as it contains alternate paths and secrets to find, you might be replaying it a bit differently to before. You are also encouraged to be more careful and to conserve your rings, to try to collect 100 of them for an extra life. Overall, this could lead to you becoming a better player, which is a good thing for a video game to encourage. One thing that was definitely annoying was the time limit of 10 minutes to complete a zone. First, the time limit is unknown to you as the game lacks an indication of there being one as the time for a level counts up rather than down. That means, the very first time we noticed that there even is a time limit of 10 minutes was when we just suddenly died and the game told us that the time is over. This is quite frankly unnecessary. It discourages exploration, experimentation and careful traversal of the level. It was especially cheap when we were about to beat a boss and the game just took away a life from us. This adds to the earlier mentioned frustration about the life limit. On the positive note, the levels are extremely well designed, alternating platforming sections, speedy sections and even puzzle/exploration sections with very great pacing. What’s more is that the game constantly throws you new mechanics and features like platforms that start moving when you step on them, flagpoles which you can launch yourself to and from in either direction and even bumpers. There is a lot of variety in the levels, which makes the game avoid feeling stale through its entire playthrough. One could argue however that some of the introduced gameplay mechanics could have been explored much more. We must say though that this adds replayability to the game, especially by being able to play through it with multiple characters. 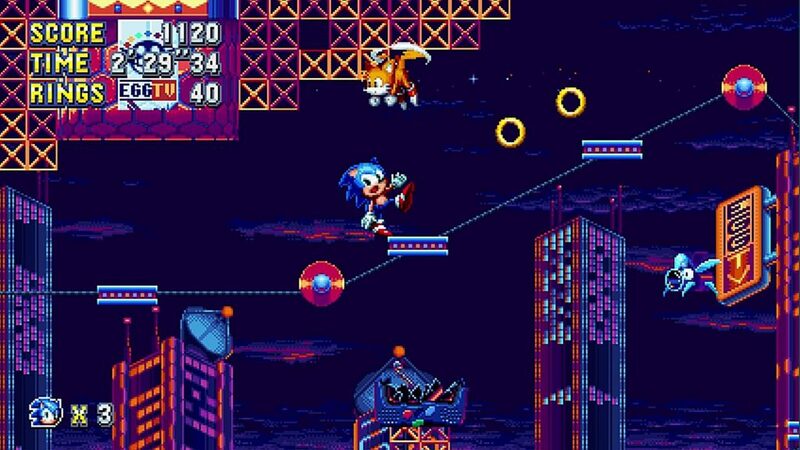 One more point that could be mentioned about the levels is Sonic’s tendency to get crushed by walls and moving platforms. If Sonic has less than 2 blocks of height available to him, he will instantly die, independent on the number of rings you hold. Even if Sonic just got hit by something else and therefore has temporary invincibility, he will still die. This is fine if a moving wall directly hits Sonic, but can be considered unfair in cases where it seems like there is still a lot of space left, especially to both to the left and to the right. The developers could have implemented Sonic to be pushed aside a little in these cases and therefore avoided the frustrations from them. On the positive side, except for the cases where Sonic is crushed by a wall, the game avoids any cheap and sudden deaths. By these we mean deaths caused by hazards that appear too quickly to be reacted to and could therefore only be prevented by memorization. Avoiding these is another great show of good level design. Overall, the levels of the game are great, but have a few shortcomings in their structure. Once again, like in other sections of the game, Sonic Mania shows a really good variety with its enemies. There really are a lot of them and the developers have really implemented some great ideas. There are enemies that can explode for example or those that can summon a current of wind. Others can fly in mid-air and others can blow off dangerous gas. Lot’s of really cool design choices kept the game fresh over its playthrough. The only thing that could have been made better about the enemies is their consistencies in weak points. It was oftentimes unclear how and when an enemy could be attacked as there seemed to be a lack of distinct characteristics that showed their hurt spots. While big spikes are definitely something you should avoid, smaller spikes seemed to be ok. With the way you are safe from a single hit as long as you have at least one ring, this is a rather small issue though. Generally, talking about the way the hurt and invincibility works is interesting, which we’ll be going into more detail with the bosses. Once again, the game shows a lot of fantastic ideas with its bosses. Every single on of them is distinct from another and that is simply great. There are even some really creative and unexpected surprises, which can really make the game an awesome experience. It is also really enjoyable how Dr. Robotnik is in some form a bit of a goofball in this game. There is just one fundamental flaw that really hurts the ability to make good bosses in Sonic, which results in those bosses being either too easy or too hard. This flaw is the just mentioned way in which Sonic takes damage. Instead of a health bar, Sonic loses all the rings he currently holds when getting hit. However, he is able to recollect some of the rings as well as getting a couple of seconds of invincibility. As long as Sonic holds at least one ring, he will live and this is a huge problem. This results in the best way to defeat bosses being to get hit by them on purpose, quickly recollect a single ring and then deal just one hit of damage to the boss during your invincibility. To make bosses challenging, they therefore have to be designed with a lot more hurtboxes than hitboxes, making it hard to approach them without being hurt. The bosses that then become big challenges are those that make it hard to recollect your rings, such as bosses where you fight without solid platforms on the floor, since you might then only be able to take two hits before dying. This is the one fundamental flaw of the original Sonic’s game design from over twenty years ago. There is after all a reason why the Death Egg Robot in Sonic 2 had to be fought without even having a single ring. There are a couple of changes here that could make sense, like making Sonic unable to damage enemies when he himself is invincible. Something else that could work would be to give Sonic a health bar and make him take less damage depending on how many rings he currently holds. He could then lose a percentage of his rings, 50% for example could work. 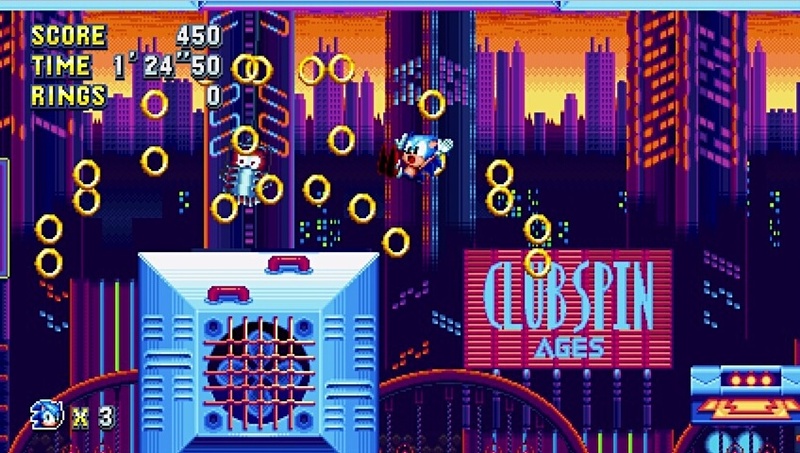 This would encourage the player to collect as many rings as possible before the boss and therefore prompt him to get better at playing each individual level. This would also prompt the player to be more careful when fighting the boss and to look for the exact moment the weak point is exposed. All in all, these were the points of critique that we had for the game. There were a few things apart from that to mention too. For example, the Time Trial mode allows you to very easily restart a level by holding the top face button. As speed runners want to waste as little time as possible restarting a level when they know they’re already unable to beat their desired time, it is a really welcome addition. There is just one more thing that we want to mention. After you finish the game, you are able choose the zones you go to freely. Here it would be nice if we could see in which levels you have already collected the chaos emeralds, to avoid having to replay and reexplore them pointlessly if you are just going for the chaos emeralds. As Red Value Gaming, we try to review games a bit differently to others, by giving a second review score in form of a monetary value. With this value, we try to give you an objective measure of the content of the game, which is evaluated separately from the review score. Since we’ve reviewed Shantae: Half-Genie Hero recently, we’ll use it as a comparison for our value evaluation. Shantae’s base game will give you around 6 hours of play while Sonic’s will get you around 5h. Both titles have a fantastic soundtrack, artstyle and atmosphere and are therefore equivalent on that front. Further, both games offer replayablity, Shantae through difficulty modes and Sonic through many alternate paths, the Time Trial mode and playing the game as three different characters. Sonic Mania definitely takes the cake on this front. Sonic Mania also offers a multiplayer mode and a lot of secrets to find, which Shantae is unable to get even with. Overall, as Shantae has received a value of $15 from us, Sonic Mania definitely deserves it full value of $19.99. Sonic Mania has a superb variety of gameplay, which makes it a really fun experience overall. However, the great amount of issues, partly stemming from gameplay designed 20 years ago, reduce the quality of the title to a good degree. With a game doing so much right but also having quite a few downsides, it makes it quite difficult to score it fairly. Alltogether, we believe a score of 79 is a fair rating. We must add that if you are rather unfussed about the mentioned points, the game will easily move up between 5 and 10 points for your own personal tastes. We can therefore really recommend this game to players who enjoy a more casual platforming experience. Sonic Mania, while having a lot of outdated mechanics, is a very enjoyable game as a lot of creativity and charm has been put into its gameplay.